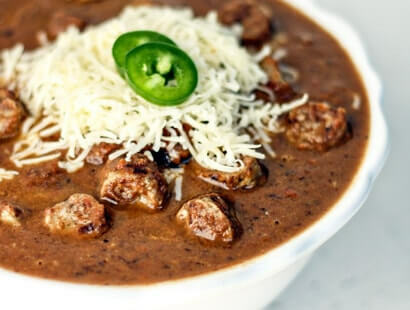 The authentic taste of Jones turkey sausage shines through this hearty soup full of bold Mexican flavors like poblano peppers, black beans and lime. Prepare sausage according to package directions. Cut links into bite-size pieces and set aside. Heat oil over medium-high heat until simmering in a large pot. Add in onions, bell pepper and poblano pepper. Cook until vegetables are soft and lightly browned. Reduce heat to medium-low and add garlic, cumin and coriander. Stir constantly until vegetables become fragrant, about 2 minutes. Stir in bay leaves, beans, chicken broth, diced tomatoes and sausage pieces. Increase heat to medium-high and bring soup to boil, then reduce heat to low and simmer uncovered for about 30 minutes, stirring occasionally. After 30 minutes, squeeze in lime juice and stir in pepper jack cheese. Purée soup to desired thickness. Serve with cilantro, jalapeño slices and top with additional pepper jack cheese. Get foodservice recipes like these sent to you monthly.